First of all, I need to state that I know I haven’t failed at parenting overall. The proof is in the pudding and the pudding is good. My boys are kind, smart, funny, and not voting for Donald Trump. They are the type of boys you want your girls to bring home. That said, parenting is like teaching. There are so many variables involved that no matter how much love you put in and how many things you do right, failures are inevitable. My youngest and I are coming to the end of a difficult era—his k-12 education. Youngest has always been the child who makes me challenge assumptions. He has made me change my mind about public school being a good choice for everyone. Even though I have always been an eccentric introvert, public school was good for me. I had rough days and some years were better than others, but I eventually learned how to manage my time around my learning style. I met and befriended people I would have misjudged otherwise. I learned how to meet deadlines and the expectations of many different types of teachers. By the time I finished middle school, I was good at school. High school was more fun than hard. I went into teaching and chose to teach in a public school because I believed in the program. So I started parenthood with the assumption that public school was a good place for my children and Oldest proved me right. He took a few years longer to master the school work part, but made a whole lot more friends. There were hard days, sometimes hard months, but overall, I believe that the experience was more positive than negative. This was not the case for Youngest. In first grade, he started coming home with vomit-inducing migraines. Those have remained a regular part of his life, as have spontaneous nosebleeds. Visits to the doctor found nothing obvious and she warned against strong anti-migraine meds for little kids. We went through liquid Tylenol like a pediatrician’s office. Although Youngest’s teachers always said nice things, school was a daily fight. The year Oldest moved on to middle school, my little one was the last one to leave home every morning and he didn’t always make it. After I got an attendance letter from his school, Youngest was required to call his Dad at work each morning to show that he was awake and moving and didn’t need a grandparent to come over and walk him to school. I kept waiting for things to get better, but middle school was almost a daily fight. Youngest would go limp as a trained protester while I had to physically drag him from bed. Eventually, Dad stepped in and gave him a talking to for giving his sick mother more trouble and guilt made him behave better. But school never got easier. Youngest failed art because he had artistic differences with the teacher. He failed 9th grade math and 10th grade English because homework just seemed unjust to him. As a high school student he has been very helpful around the house and delightful to talk to. I hear interesting things from his classes on a regular basis. He does extensive independent research on topics that catch his interest. Youngest has learned to tough out all but the worst headache days. But most days are still headache days and he only competes assignments when he can see their value. My son does see and feel the world differently than the average person. He doesn’t like music. At best, he learns to tolerate things that are familiar and will sometimes find something worthwhile in the lyrics. Movie theaters are agony. As a family we watch lots of movies together on TV, but Youngest gets to decide whether or not a movie on he giant screen is worth the headache that comes after. Smells, bright lights, noise, any kind of chaos is physically painful. 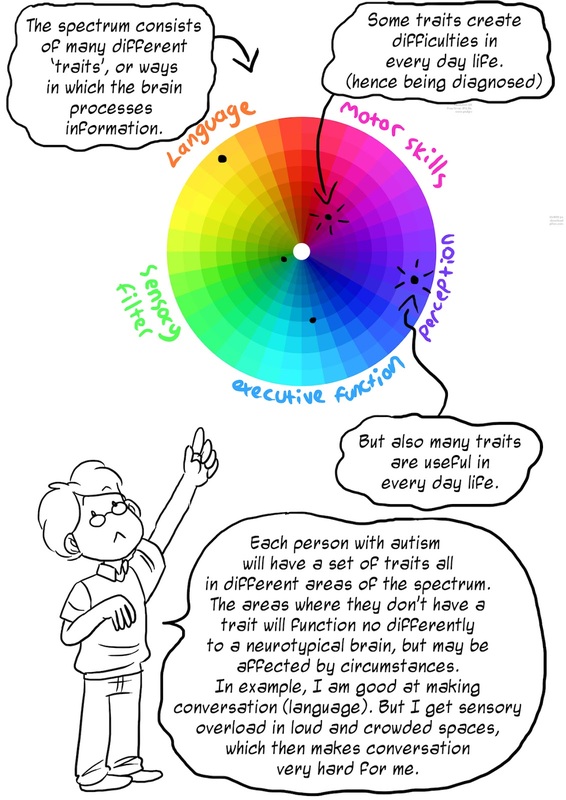 Although no one has ever suggested testing, and Youngest doesn’t come across as autistic, he definitely fits some of the qualifications. In fact, a comic I found online this very week explains his situation very well. This child will graduate. Today was his last day. But it has been a struggle every step of the way. Hopefully there have been redeeming moments from Youngest’s point of view. But there had to be a better, easier way. With two working parents and a middle-class income, we never considered private school or home schooling, but as a professional educator and a loving mom, I really think I should have recognized that Youngest was in the wrong situation and looked for something different. 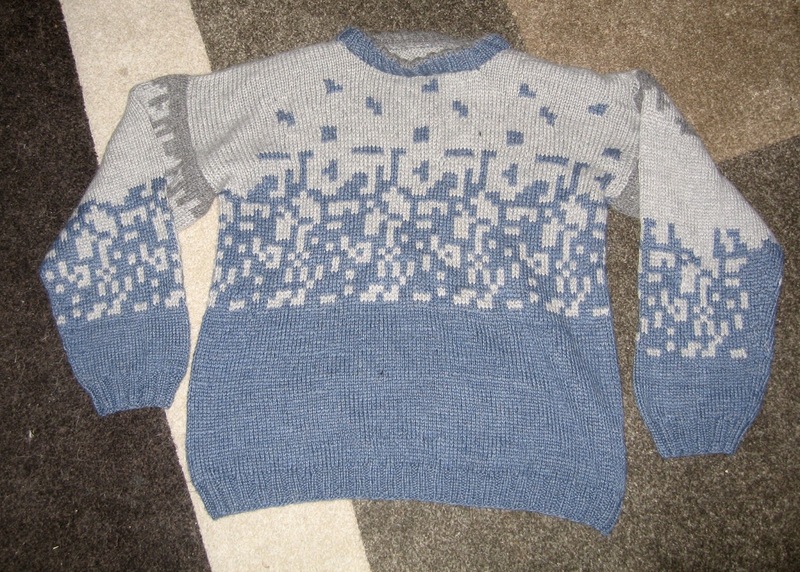 This is an appropriate place to show a knitter fail for the same child. Youngest outgrew this homemade sweater and was ready for a man sized one. He approved a pattern and yarn color and I bought a nice, expensive cotton/wool blend that I thought would be warm enough for a winter walk to church without needing to be immediately removed indoors to avoid heat stroke. 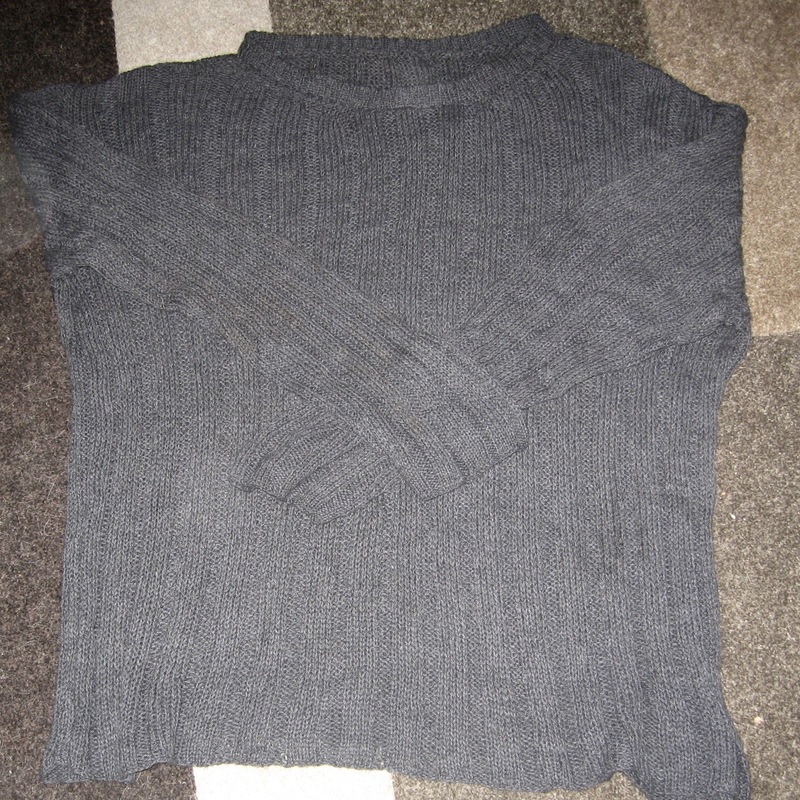 I only make men’s sweaters for love, not money, because they are huge and monotonous. As I worked on this one, I had the horrible feeling that it was getting too huge, but Christmas was too close to start over. The sweater ended up looking fine, but it should have fit the person who looks good in this black shirt. He was kind enough to wear it to church one time. I am really hoping it will fit Oldest who is three inches taller and 50 pounds heavier. 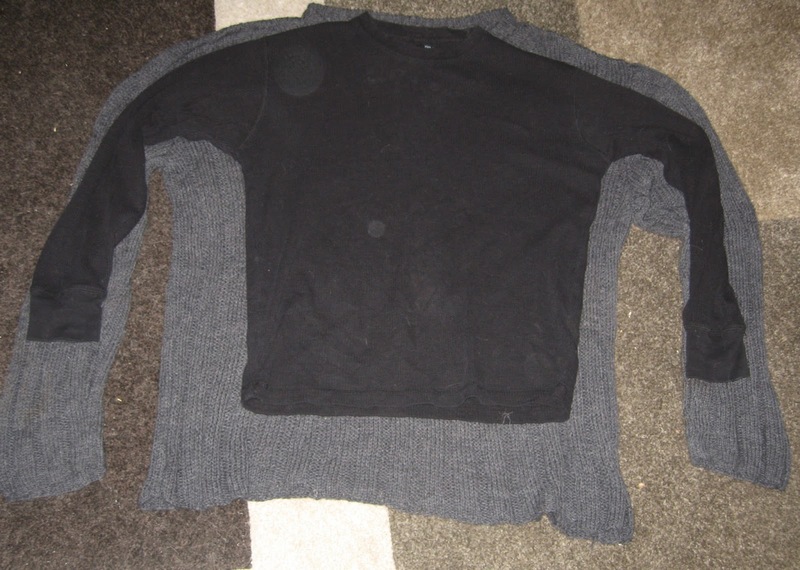 I am going to have to make up my own pattern to make a sweater that fits. This time it will be homespun as well. So far, I've spun a little. 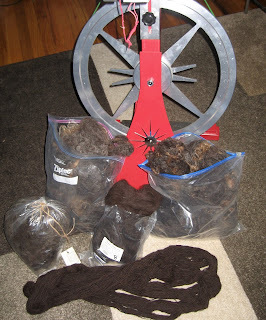 I have a little wool combed a lot just washed and some not even that done My plan is to finish spinning and knitting before autumn cold. I’ll let you know. 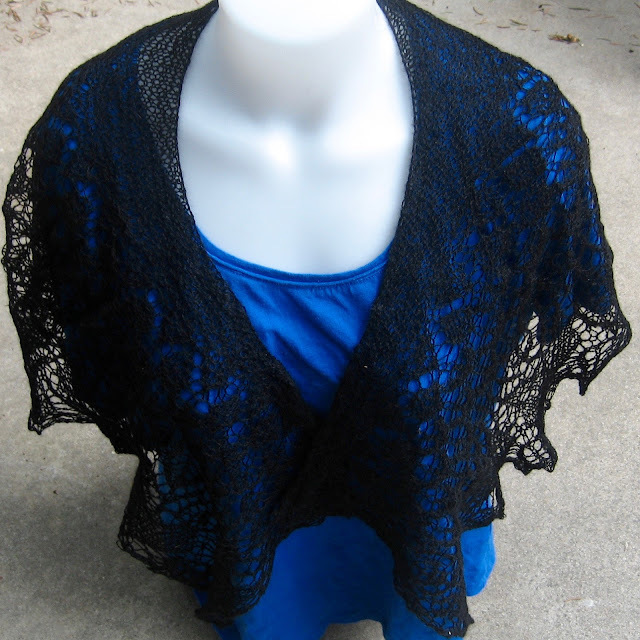 Today I am going to post two new shawls to my store. Both were made from kits I bought this year right after I left work. I had this crazy theory that I had a lot of time and I bought way more wool than I should have. Facebook knows me too well, so I get a lot of ads from yarn shops. 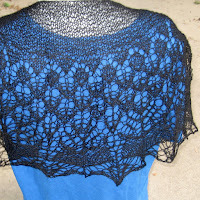 Craftsy has gorgeous patterns and yarn go with them. I struggled with both of these. 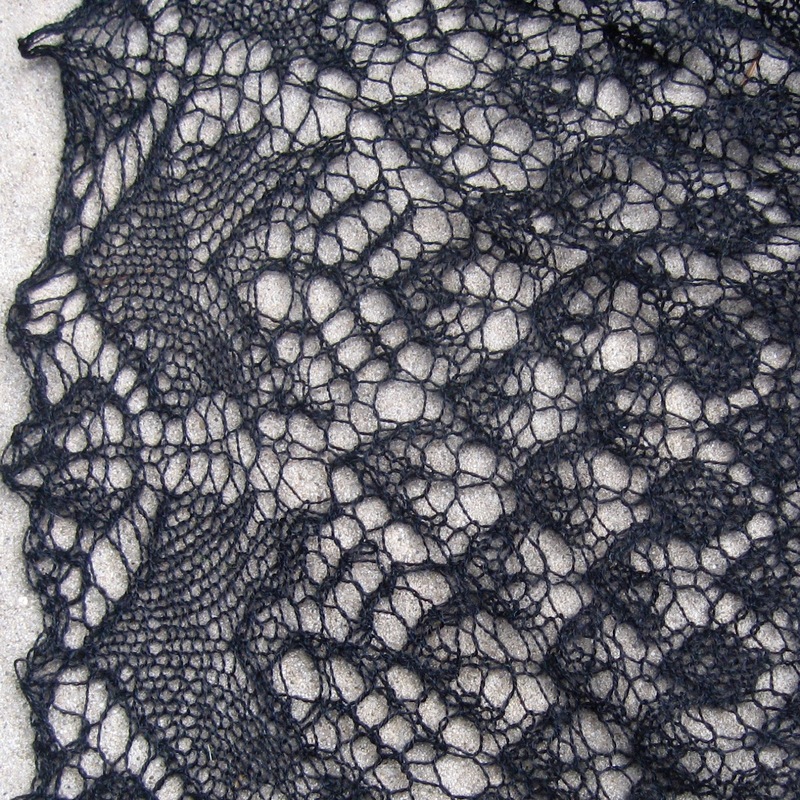 The lace semicircular shawl was hard because it is lace. 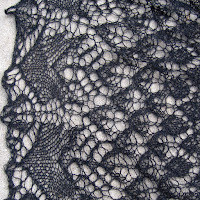 Lace patterns look a lot like counted cross stitch. You have a specific instruction for each stitch. It's a fun challenge when my brain is working right. 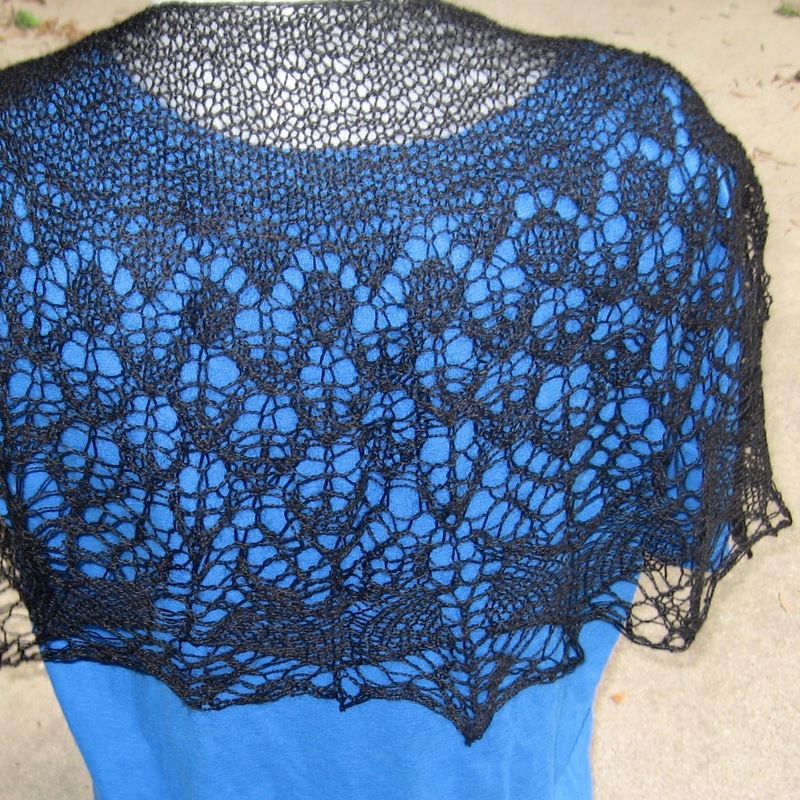 Since my brain was not working right and black yarn is hard to see, this one took way too long to finish. It did turn out pretty. 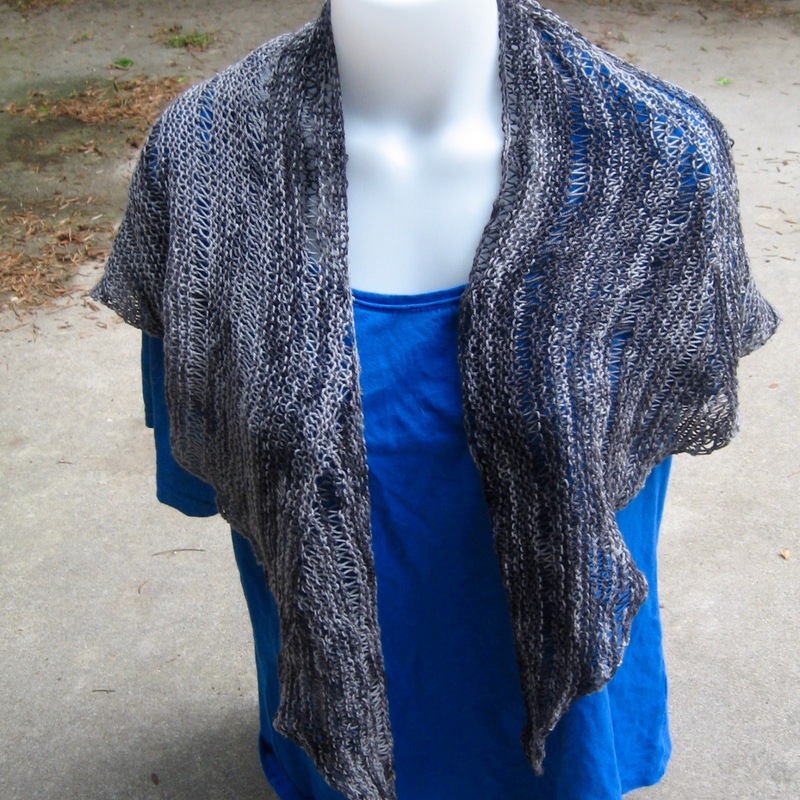 It is made of 100% merino wool and is plenty soft to wear next to the skin. It could add a little warmth or a little modesty to any summer dress without getting too hot. It is available at my shop for $60. 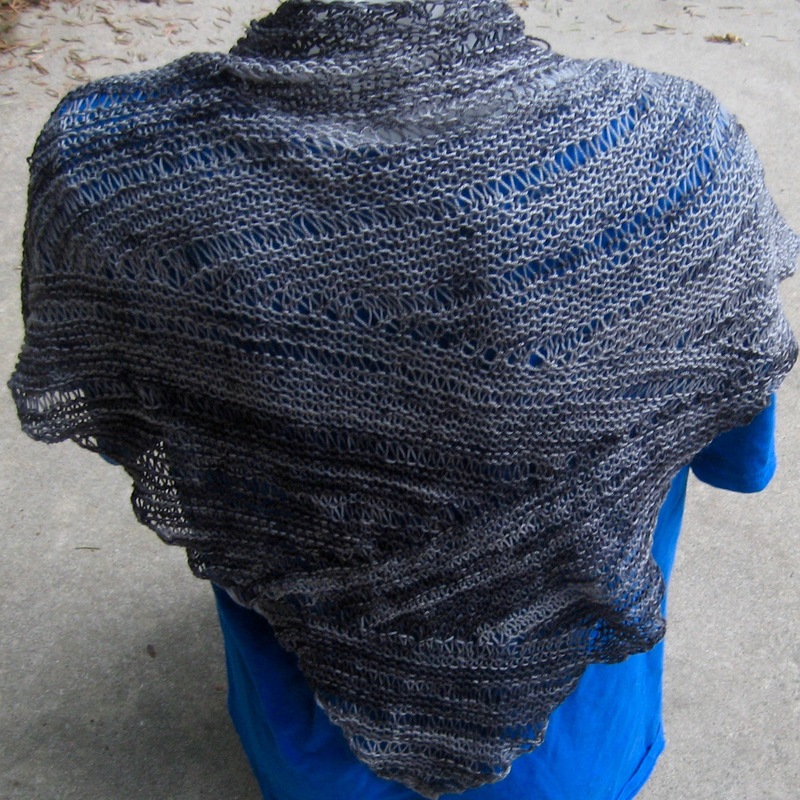 The next shawl was very different. The actual knitting was easy, but the pattern gave me fits. 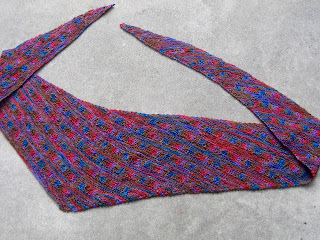 The shawl was supposed to end up with five triangles in a semicircle. I could never get that shape or the right size by following the pattern, so I added one more triangle to make it a large triangle. If I were to keep one of the two, this would be the one. I like the simple, modern look. It will be on sale in my shop for $50.